Why not Jazz up some boring furniture by Creating a two toned banded top. You can use this technique on just about any two piece round table. Why not Jazz up some boring furniture by Creating a two toned banded top. This is actually a pretty simple process on a square table, but you can find simple procedures all over You Tube or other places on the net. You come to The Refinishing Studio to learn the cool stuff!! So....lets have a little fun and make this job a little more challenging by using a ROUND table. If you're like I was when I first came into this job, you're thinking to yourself, what's so hard about a circle? Well, a lot, so I found. No worries, I figured it out so you won't have to. But hey, that's why you come to The Learning Center in the first place, right? So, let's get started !! 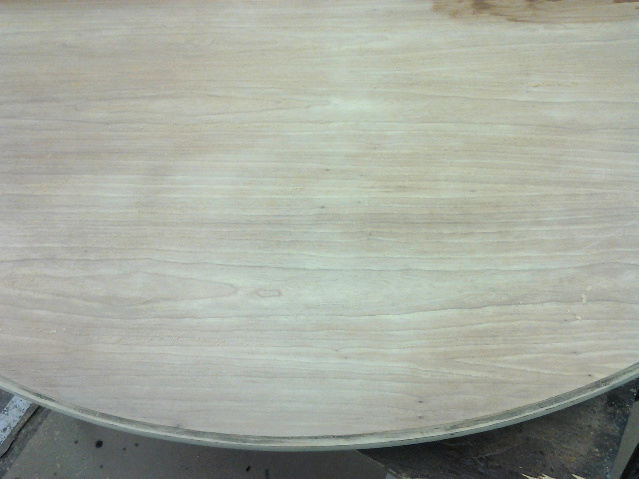 As you can see below, the table I am working on is not only perfectly round (it must be round, not oval), it's incredibly plain! 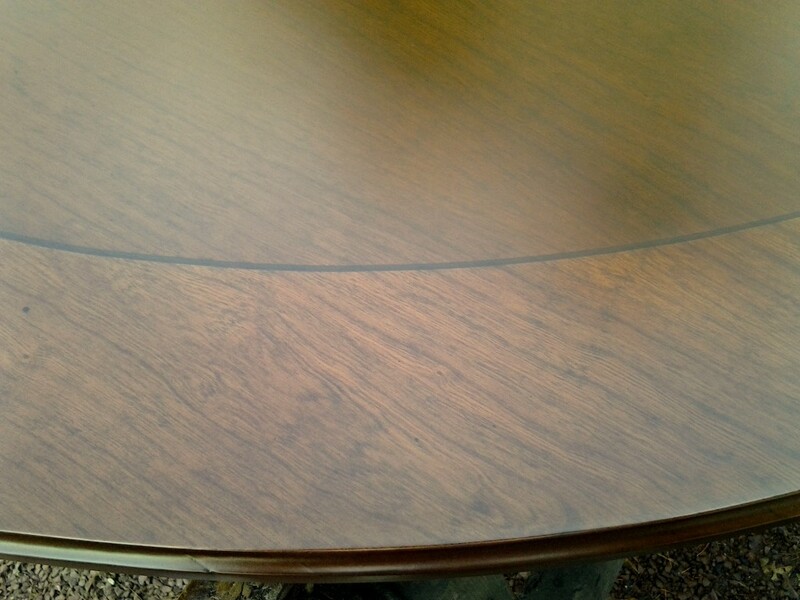 Being a professional refinisher, I get paid to make furniture look spectacular, and this cherry table was originally two toned with a lighter banding around the outer edge. It was done well from the factory, but it was all in the finish, so once I stripped it I was left with a very plain table. I don't recall ever attempting this procedure on a round table, so we'll need to be creative. 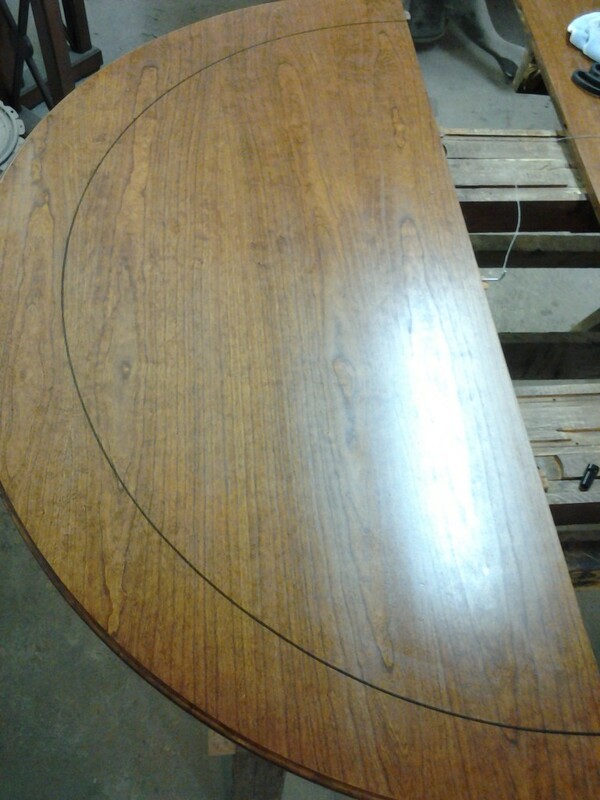 Below: The first step is to strip and sand your table. 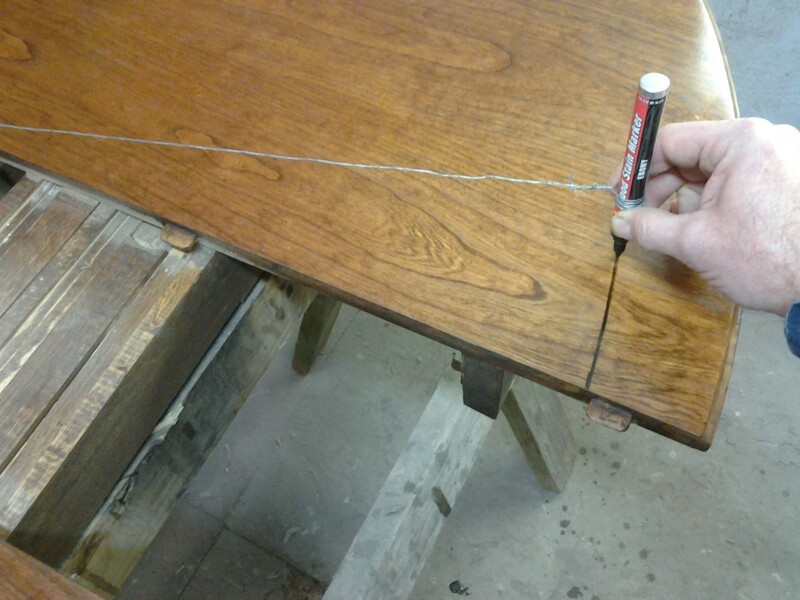 We have a Tutorial to show you How To Strip A Table. 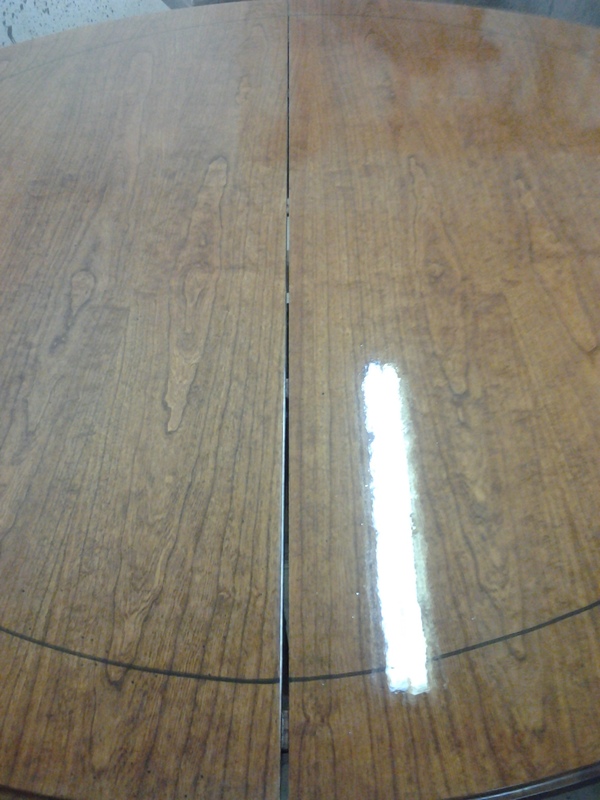 Once clean from all traces of old finish, you can proceed with the sanding. We have a Learning Center Article for you that will tell you Everything You Need To Know About Sandpaper. Here is another Article for you on How To Sand Raw Wood. After our stain dries, we'll go ahead and apply a few coats of clear finish. I use lacquer on this project spraying it on with a spray gun and air compressor. This is a finish you want to achieve by spraying it on, but if you don't have a spray gun and compressor, you can use lacquer in aerosol cans. Here is a Learning Center Article A Beginners Guide To Spray Finishing. Here is another super helpful Article on How To Finish Using Aerosol Lacquers. Now for some "MacGyvering". I took a large finishing nail, and bent it 90 degrees. 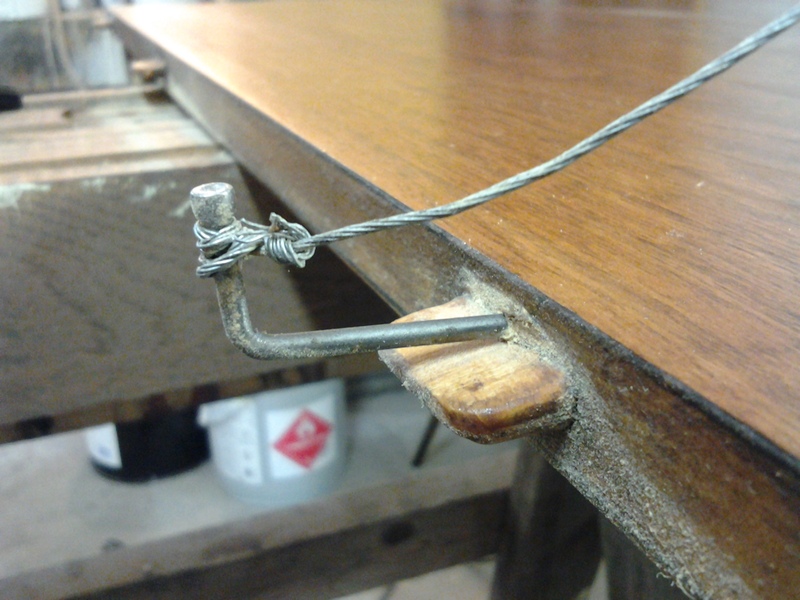 I then attached a piece of picture frame wire to the nail as pictured Below. 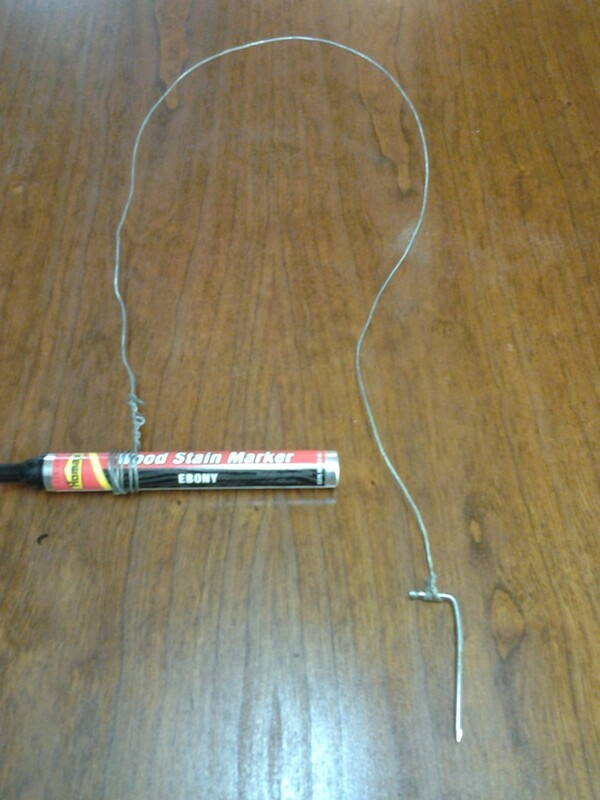 It's important to use wire (not string) because we want ZERO stretch. 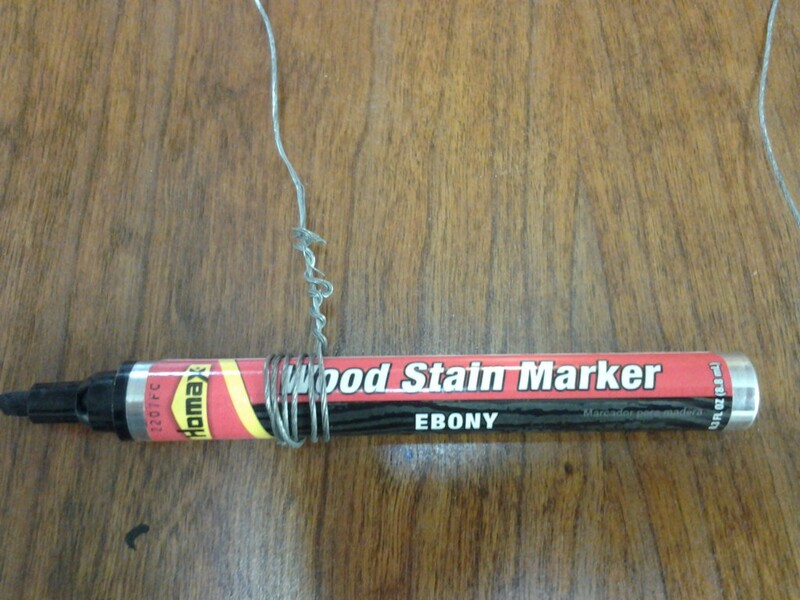 On the other end, I attached an Ebony colored stain marker by wrapping the wire around the marker, and then doing a haywire twist to secure it. I have not lost my marbles - this is gonna work! Now that we have our really awesome high tech lining tool assembled, secure it dead center on the inside half of the top, as pictured Below. To begin our line, hold the marker and pull taut. Start at one edge and begin to draw your half circle. 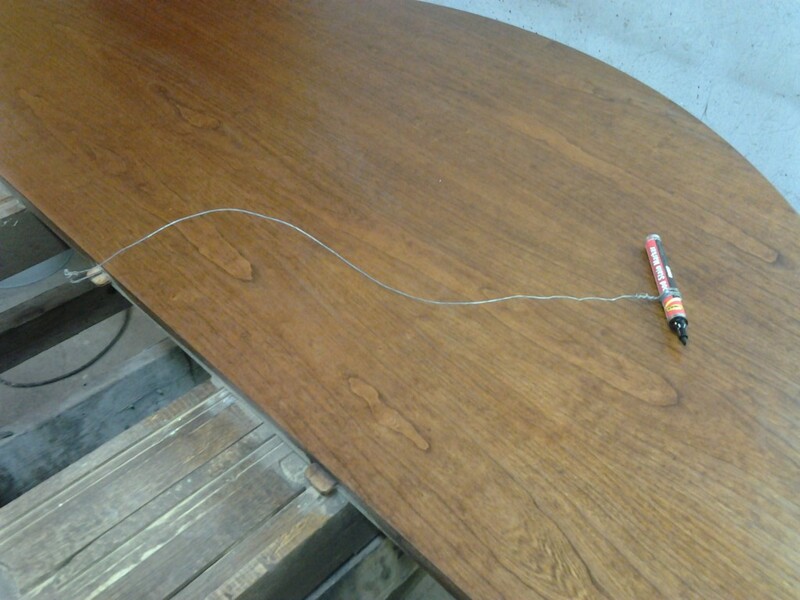 Below: We are using a stain marker, because it will be easy to wipe off our line and try again if we make a mistake. Below: Now you see where I'm going with this? Below: One side down, one side to go. Side two will take a little positioning of your high tech lining tool to get it exact. You may have to wipe your line off once or twice until you get both sides to match up perfect, but that's why we use the stain marker. While still wet, the line will wipe off with relative ease. 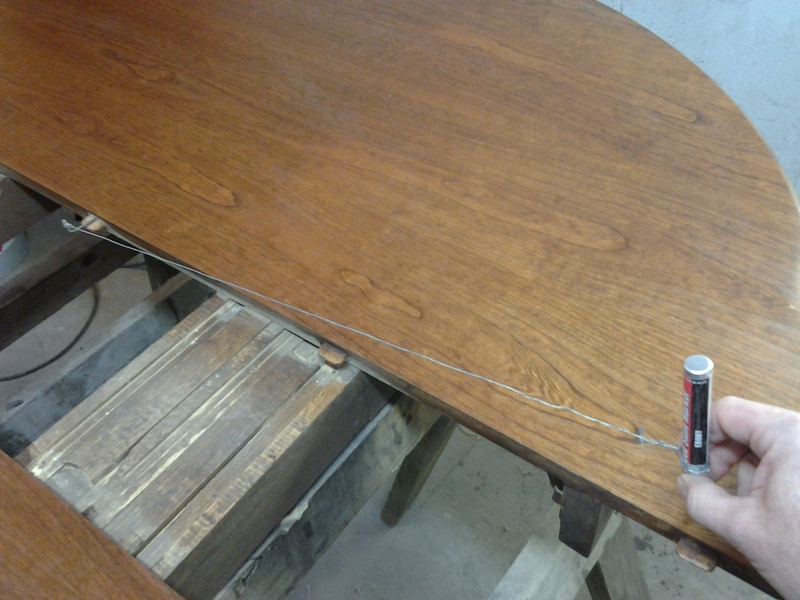 Below: With both sides lined, we will seal it in by spraying a couple coats of lacquer on our table. Once the lacquer is dry, our line is now part of the finish. Below: Our next step in achieving a toned banding is to tape out the outside banding. 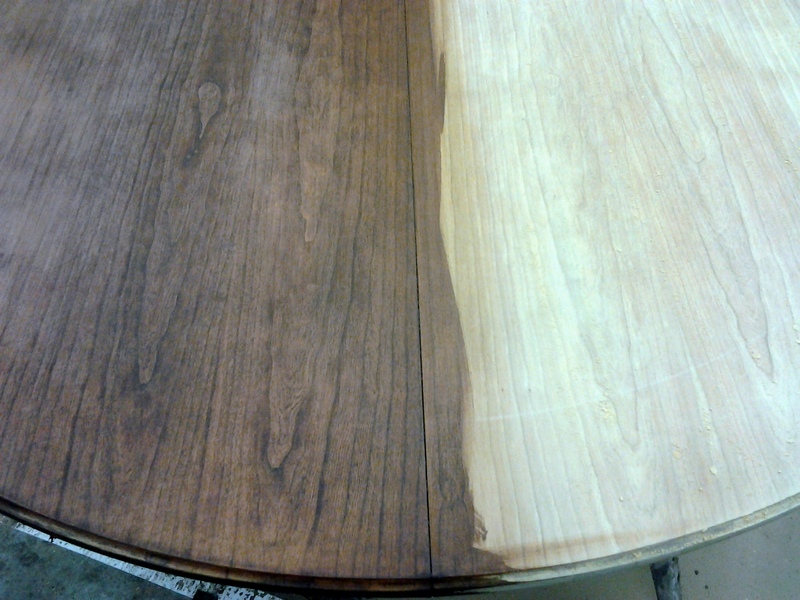 This is the reason it's important to seal in your line with a couple coats of lacquer, and allow it to dry. We don't want the tape to pull up any of our line color. Take your time here, taping a circle is not a quick process like it would be taping a square. 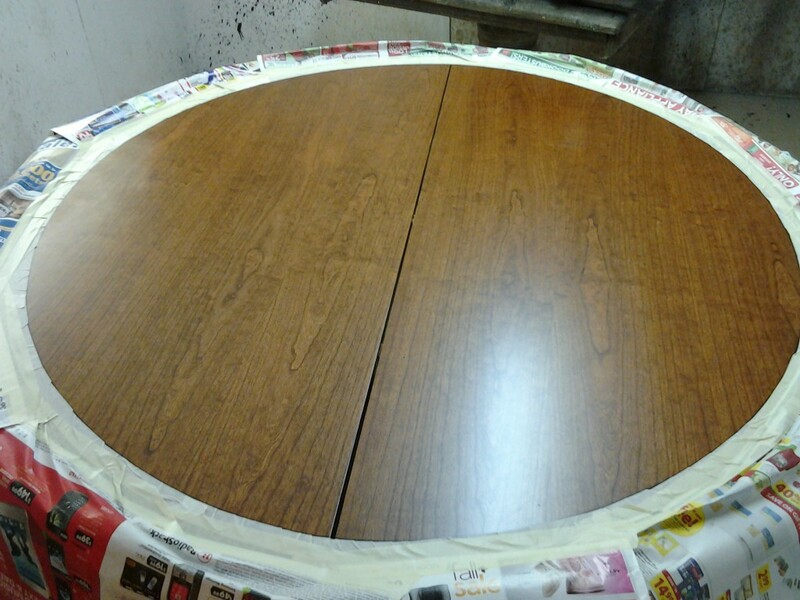 With the top taped and ready, we can tone the inner circle darker. 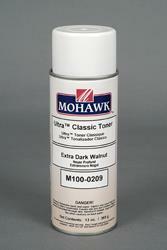 I will be using a dye that I will add to my lacquer from Mohawk called ultra penetrating stain, also known as NGR stain. If you read the Article Understanding Different Types Of Stains, then you already know all about NGR stains. If you are doing this project using Aerosol lacquers, you'll be using a product like Mohawk Ultra Classic Toner Aerosol. Once you choose the toner color you want for your table, we'll apply a couple light coats of toned lacquer to our inner circle. When toning, be sure to practice on a test surface first to get the hang of it. It's non-reversible without starting over and stripping the finish, so this is one step you want to use extreme caution. 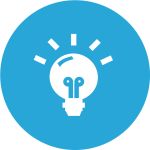 TIP: When spraying a toner lacquer, hold the aerosol can, or spray gun higher above the work surface than normal. As much as 24 to 36 inches above the surface is good. This spreads the "spray fan" very wide, and eliminates the likelihood of getting lap lines in your color. It will create a much more uniform color and a better overall look. Below: I choose Medium Brown Walnut Mohawk NGR stain and added a small amount to my lacquer to give my lacquer a translucent color. You don't need to get all your color in one coat. I prefer to go easy on the color and apply a couple lighter coats. The rule of thumb here is you can always add more color, but you can't easily take it off. If you look at the masking tape, and you can get a good feel of how much color I added in one coat of finish. 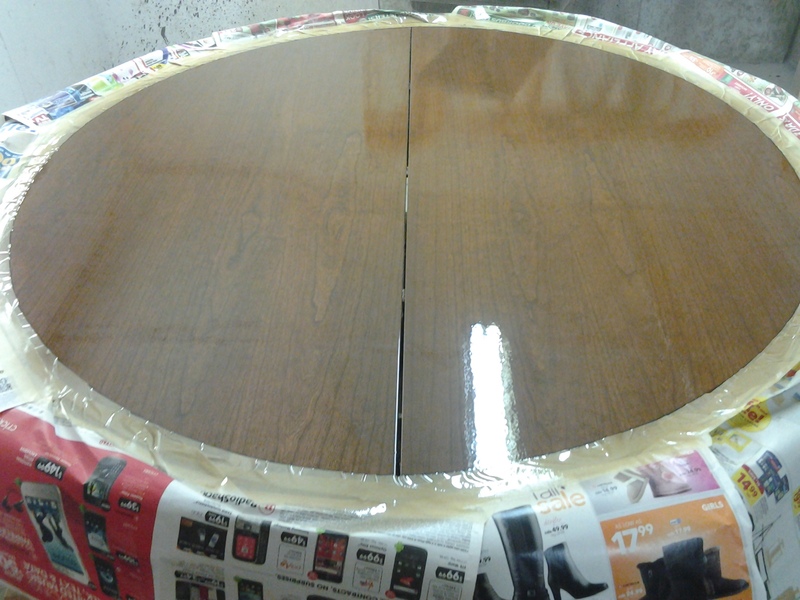 Once your color coat(s) dry, remove the tape & paper and apply two coats of clear lacquer. Once those two coats fully dry, finish sand and wipe clean using a tack cloth, or lint free rag, and apply your final coat of clear lacquer. 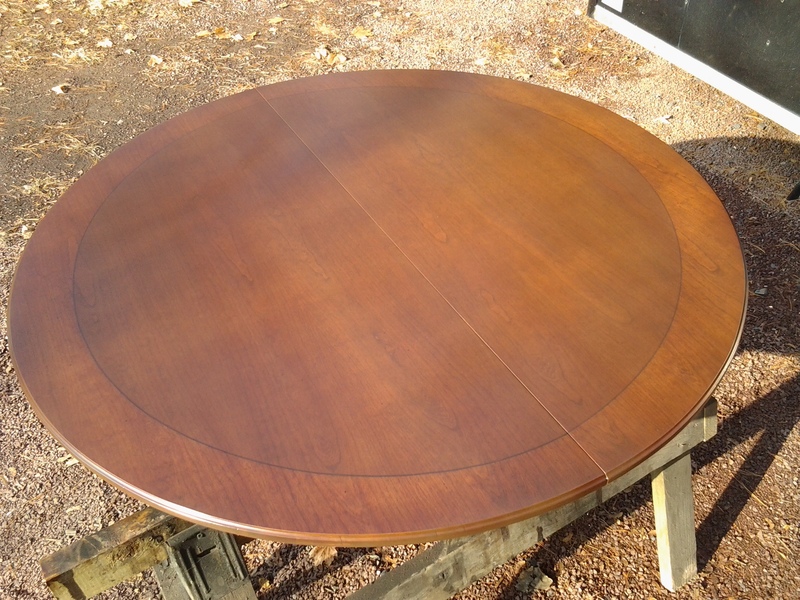 Below, the finished table. Pretty cool, right? I hope you found this project inspiring! !